While Madhavan underplays and internalizes the character, Sethupathi just goes with the flow, mixing bravado and craftiness in equal measures. Vedha is the dark pulsing heart of the film. The events that change one’s life don’t always happen with perceptible slowness. It may not often provide breathing space for a person to react as per their gut feelings. But a good cinema keeps moral questions at the fore, bestowing us with a moral compass in a world that’s bafflingly gray. 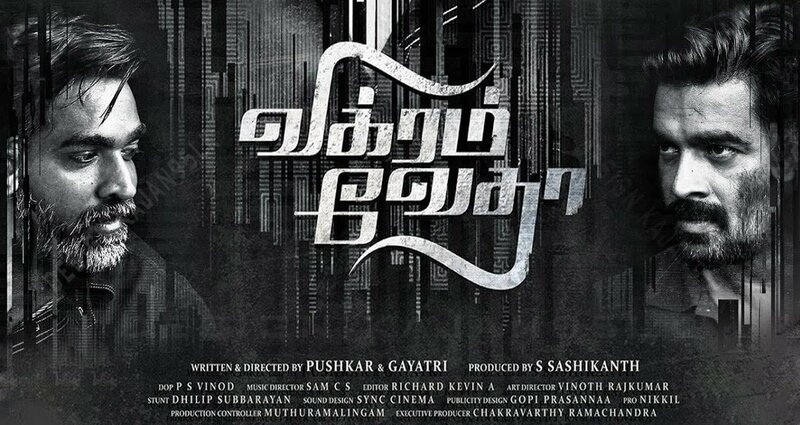 Husband-wife directing duo Pushkar & Gayathri’s crime thriller Vikram Vedha (2017) pits a clean-handed police officer against a remorseless gangster, although the adjective which describes their character nature is put into question by string of freshly unearthed predicaments and moral dilemmas. Tamil movies often find it hard to create mass entertainers with two strong male leads; partly due to the excessively demanding star persona and flat characterization. The spectacular leads – Madhavan and Vijay Sethupathi – and smart writing uproots those storytelling troubles to brings us an absolutely engaging entertainment. Pushkar-Gayathri propels their characters through mordantly funny and pulpy narrative structure. There are obvious flaws and familiarities in the approach, but it doesn’t exactly water down the narrative’s high-wire intensity. As an interpretation of popular child-lore Vikramadityan and Vetal, the film plays up with a police officer’s monochromatic vision of good and evil. Vikram (Madhavan) is an experienced cop who is part of a task force with a mission to eliminate the notorious Vedha (Sethupathi) and his gang. The film opens with a well-crafted encounter sequence where Vikram casually walks through an old building, effortlessly striking up conversation with other members of his force. Before long, he blasts through a door and shoots up all the gang members without any hesitation or remorse. Vikram later says he can soundly sleep after a successful encounter because he knows that world is better off without these gangsters. But already Vikram’s righteousness is brought to question, especially when he shoots down an alleged gang member who holds no weapon and tries to surrender. Vikram frames the crime scene to cook-up the perfect forensics report, and yet he fiercely believes to be on the right side of law. When Vedha continues to elude Vikram’s men they plan a full crackdown on the gangster’s unassailable home ground in the North Chennai area. As the riot police deliriously move out of the station, geared-up for action, Vedha makes a calm entry (accompanied by a thunderous Bgm and deafening whistles in the audience section) into the police station to surrender. The scheming gangster with 16 murders to his name decides to play a mind game with his nemesis Vikram. He recollects key events from his life in brief episodes (starts with the punchline ‘Sir, oru katha sollata?’, ‘Shall I tell you a story?’) and at the end of each episode, Vedha poses a moral question and Vikram’s answer to each blurs the strict boundaries between good and evil. Furthermore, the specifics of the flashbacks may provide clues to Vikram to solve the mysterious present-day crimes. The crux of the story is familiar and when the moral conundrums are solved it looks like a fairly simplistic tale. However, the twisty, non-linear narrative attaches interesting perspective to the otherwise thin story. Indian movies’ idea for anti-hero is always confined to ‘gangster with a golden heart’ definition. They do bad things for noble reasons. But in the characterization of Vikram & Vedha there’s no clear line delineating good from the bad. They possess certain right reasons but the means to achieve it predominantly rests in the morally grey area. Directors Pushkar-Gayathri’s previous two films (Oram Po, 2007 &Va Quarter Cutting, 2010) also explored the quirks and exploits of two lead roles, but the results were ultimately underwhelming. Now they have made their first unassailably well-crafted movie. Cinematographer PS Vinod and the directing duo brings double thrill in the scenes the two fine actors play off each other (employing simple yet effective over-the-shoulder & profile shots). The female characters — played by Shraddha Srinath and Varalaxmi Sarathkumar — are also written well. They are as unapologetic as the tale’s men characters and play vital role in the proceedings rather than being used as eye-candy. 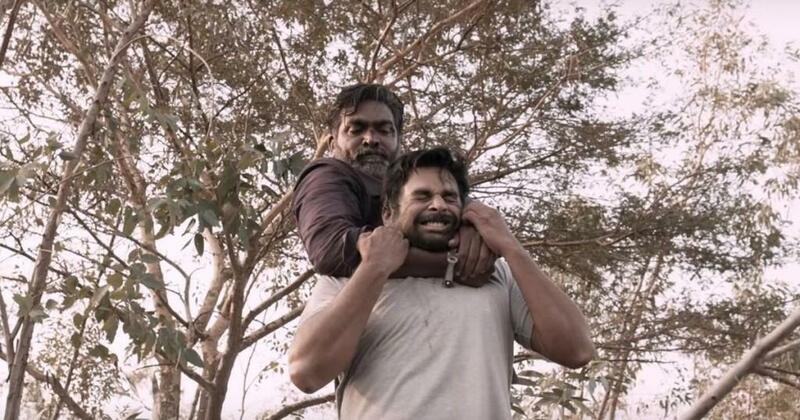 The confrontation scenes work perfectly because Madhavan and Sethupathi don’t worry about dwarfing each other. The words seem to spark out from their character’s intuition and gut feelings. While Madhavan underplays and internalizes the character, Sethupathi just goes with the flow, mixing bravado and craftiness in equal measures. Vedha is the dark pulsing heart of the film. Despite talking about dharma and posing moral questions to Vikram, Vedha does like to gun down rivals in broad daylight. Sethupathi keeps Vedha opaque, and at some point we really believe the character is capable of doing vile things with a smile. The film’s second-half is a full-fledged ‘Sethupathi the star’ show. Yet, his charming one-liners and the stylish walks doesn’t come at the expense of diluting the story flow. There are definitely some flaws in the predictable flashback, which more or less adheres to the rules of gangster-film grammar (sentiment, rivalry, drunken song, etc). The choreography of the violent face-off comes off as mere gratuitous actions. But the good thing is that Vedha’s past is fleshed-out in small episodes which never become tiring. The ending portions are smartly executed and the union of two opposing moral universes thankfully doesn’t lead to wan buddy movie territory. Even when the enemies’ identities are revealed and they are conquered, Vikram and Vedha are destined to stand at opposite sides, committed to do what they do best. Armed with a clever script and fantastic lead performances, Vikram Vedha (147 minutes) offers a deliciously entertaining take on the standard cop and thief tale.